Attends Slip Active 8 are a collection of all-in-one disposable incontinence products suitable for people with moderate urinary and faecal incontinence, specially designed for those with a more active lifestyle. The pads include a Natural Odour Protection technology designed to reduce the risk of unpleasant smells and provide you with extra confidence during use. 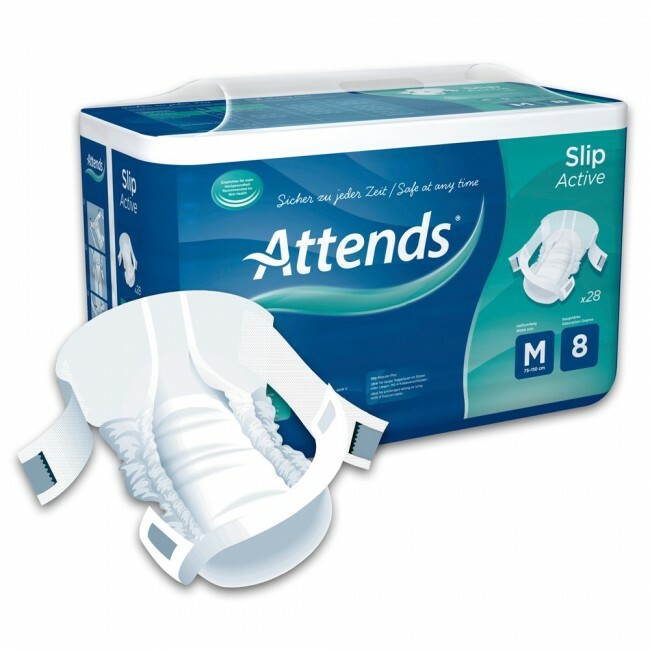 A super absorbent core is built into the pad to provide maximum comfort during use and provide consistent skin dryness, and a soft polyethylene waterproof back sheet is also built in to the pad to further aid containment. Positioning tapes and two re-sealable fixation tapes are included in the product for ease of fitting. Finding the correct size is extremely important, to do this you should measure your hip and waist size, and whichever is larger should be used as a reference for choosing your ideal size.